A new giant slide is the latest attraction unveiled at Downtown Dubai, the vast residential and entertainment district developed by Emaar Properties. Downtown Slide is a first-of-its-kind project boasting a prime location in Burj Plaza, overlooking the world’s tallest building, Burj Khalifa, as well as popular retail hub, Souk Al Bahar. The stainless steel slide is seven metres tall at its highest point and has been designed by the same company that created SEGA Republic's 'Giant Slider' attractions. Riders travel along the 19-metre-long tube, mounted at a 30-degree angle, eventually meeting a soft landing on the two-square-metre floor mat at the bottom. 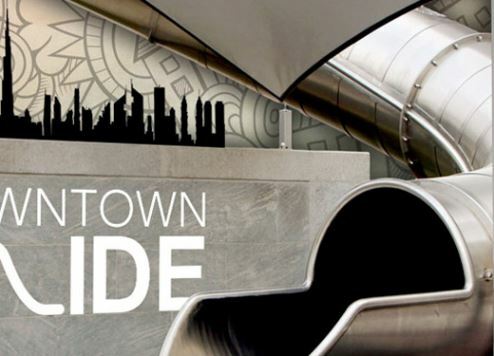 “Innovative technology ensures that Downtown Slide is safe and cool for riders to use, even in peak summer; state-of-the-art insulation has been incorporated into the integral design which keeps the internal area of the slide cool even when external temperatures exceed 100 degrees centigrade on the exterior," said Emaar in a statement. Downtown Dubai welcomes tens of millions of visitors each year where attractions also include The Dubai Fountain and Burj Khalifa SKY, the highest outdoor observatory in the world. The slide will be open during Ramadan from 5pm until 2am while normal opening hours are 4pm until 1am. It is open to all members of the public and is free of charge. Meanwhile, another iconic project is set to be unveiled in Downtown Dubai – Dubai Opera. The waterside opera house features a proscenium arch theatre, an acoustic concert hall, and a 2,000-square-metre flat floor event space. Tickets for upcoming events due to be staged at Dubai Opera have already sold out. All 2,000 tickets to see virtuoso Plácido Domingo, who will perform Dubai Opera’s opening show, were snapped up within three hours by buyers from more than 20 countries. Tickets for the award-winning musical Les Miserables (10-24 November) are also selling fast.